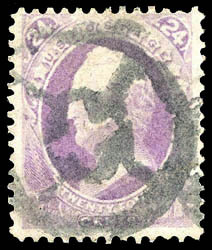 Circular Geometric, full strike on 24¢ purple (153), wide margins, couple perf creases at top, a Very Fine and choice strike, illustrated in Van Vlissingen & Waud on page 46. Weiss No. GE-S6 Estimate $750 - 1,000. THE FINEST EXAMPLE OF ONE OF THE RAREST NEW YORK FOREIGN MAIL CANCELLATIONS. Only one on cover example is recorded with very few off cover examples known. This is one of the highlights of the Kirke NYFM off-cover collection. 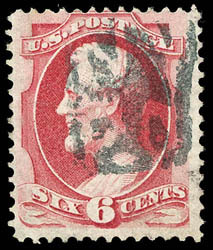 Cross within a Cross Geometric, clear strike on 6¢ carmine (148), strong color, Very Fine and choice strike of this rare cancel; with 2004 P.F. certificate. Weiss No. GE-S6 Estimate $200 - 300. 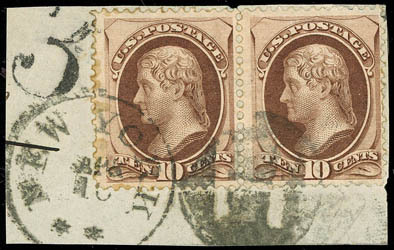 Negative "H", duplexed with "New York Apr 16" cds ties 10¢ brown (150) horizontal pair on small piece, Foreign "3" due handstamp top left, Very Fine; with 2003 P.F. certificate. Weiss No. RE-L1 Estimate $150 - 200. 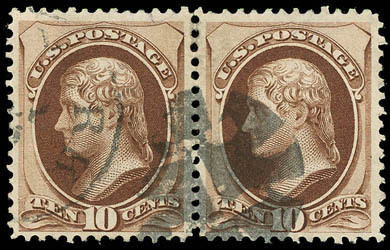 "H" in Cogwheel, bold strike duplexed with New York cds on well centered 10¢ brown (150) horizontal pair, fresh and Extremely Fine; with 2003 P.F. certificate. Weiss No. RE-L2 Estimate $200 - 300. 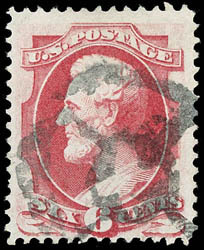 Segmented Geometric, full sharp strike on 1871, 7¢ vermilion, H. grill, rich deep color, choice centering and margins, Extremely Fine, a gem stamp and strike; with 1996 and 2004 P.F. certificates. Scott No. 138 $500. Weiss No. RE-L2 Estimate $400 - 600. Negative "N.Y.P.O. 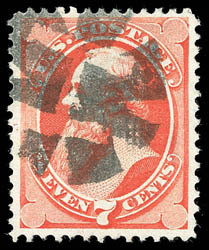 ", unusually clear and complete strike of this rare cancel on 6¢ carmine (148), rich color, tiny corner crease, otherwise Very Fine and choice strike of this rare cancel, Illustrated in Weiss on page 220., ex-Weiss, Ainsworth; with 2004 P.F. certificate. Weiss No. RE-L4 Estimate $200 - 300. 4-Point Elaborate Star, perfect sharp strike on 3¢ green (147) vertical pair, nat. s.e. at right, bright and fresh, a Extremely Fine strike, ex-Mercedes. Weiss No. ST-4P2 Estimate $150 - 200. 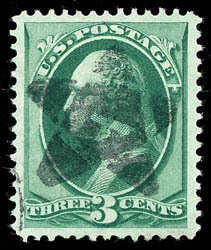 Segmented Star with Negative Cross, clear central strike on 3¢ green (147), exceptionally well centered within large balanced margins, an Extremely Fine gem; with 2004 P.S.E. certificate. Weiss No. ST-5P2 Estimate $200 - 300. 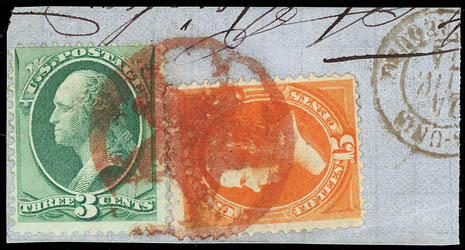 Shaded Star in Circle, bold red strike ties 3¢ green (158) and 15¢ yellow orange (163) on small blue piece, also shows French transit at right; 15¢ small tear, F.-V.F., Illustrated in Weiss on page 50., ex-Braden; with 2003 P.F. certificate. Weiss No. 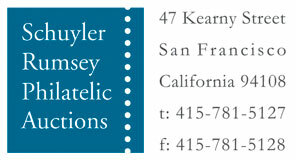 ST-5P3 Estimate $200 - 300. 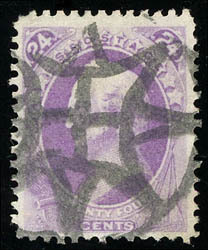 Star Geometric, bold central strike on 24¢ bright purple (153), nicely centered with beautiful vibrant color, fresh and Very Fine. Weiss No. ST-8P5 Estimate $150 - 200.